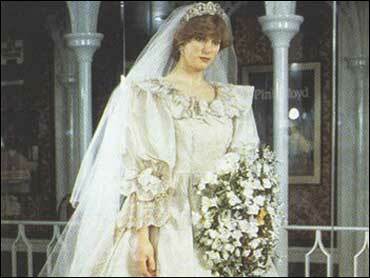 A dispute has emerged over Princess Diana's duplicate wedding dress: Was it a backup? Or was it made specifically for a Diana mannequin at Madame Tussauds wax museum? Perhaps most important, did the princess ever wear it? Auctioneers Cooper Owen are offering at a Dec. 7 sale what they say is a replica of Diana's original silk gown, created for the 1981 nuptials and on-hand in case the real one was damaged. They say the princess actually tried on the spare gown and have set a reserve price of $90,000. Designer Elizabeth Emmanuel, who created the dress with her ex-husband David, disputes all that. She said Thursday the dress was made for the wax museum — not as an emergency extra — and that the princess never wore it. "Diana never tried the dress on, it was never a backup dress," she said. "David and I were there. Unless I am having a brain seizure, trying on a second dress was the last thing Diana would have done. ... She was so busy, we had to fit all our fittings around her schedule. There was absolutely no way she could have tried on that dress." The auction house is standing by its version of events, which are backed up by Madame Tussauds. John Collins, managing director of Cooper Owen, told The Associated Press he was satisfied that Diana had worn the dress, "otherwise we wouldn't have gone ahead." A curator for Madame Tussauds in 1981, Christina Bennett, also said Diana wore the gown "during fittings for her wedding dress." "This dress was kept until the last minute in case the original was damaged or stained during the day's proceedings and Diana needed to change," she said. A spokeswoman for the museum, Carla Evans, said the dress was displayed at Madame Tussauds in 1981, in honor of the wedding, and in 2000 along with replicas of other British royal wedding gowns. She said Madame Tussauds put the dress up for auction because it does not fit with a shift in the museum's philosophy away from mannequins displayed behind glass and toward more interactive displays that people can touch. Millions of television viewers around the world watched Diana marry Charles at St. Paul's Cathedral on July 29, 1981. The couple divorced in 1996, and she died in a car crash in Paris in 1997. Her true wedding gown is on display at her family's country home near Northampton, central England, where she was buried.